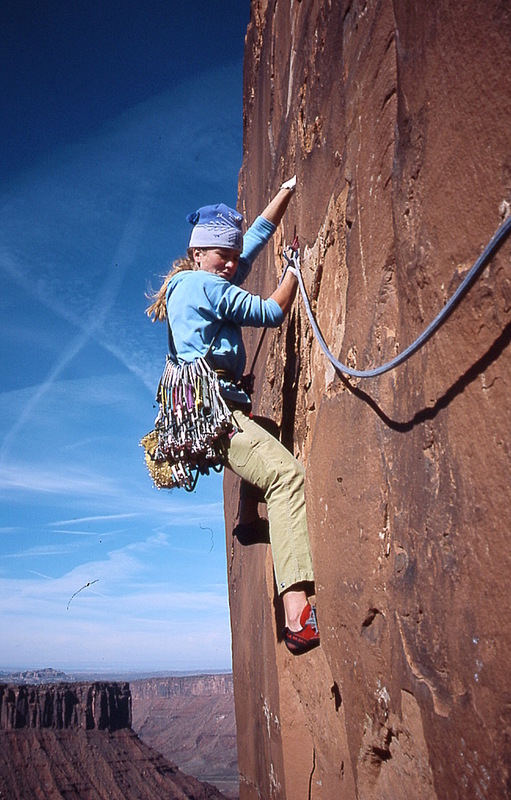 Carolyn Parker, Founder Ripple Effect Training, AMGA Rock Guide, puts her Climbing Training Program to use. Indian Creek, Utah ©Carolyn Parker collection. Get on the climbing training program. This is especially true for intermediate to advanced climbers. It’s common for intermediate to advanced climbers to feel stuck and unable to make progress. In order to take your climbing to the next level, you need to train. Your fitness level is one of the most significant factors affecting your ability to progress. Adding to this, it’s been a long winter. I don’t know about you but I’m jones’ing for some sun and warm rock climbing. The transition back to climbing after the winter can be especially difficult. Fingers and other joints have lost their conditioning and avoiding injury is just as important as getting fit and strong. The following climbing training program will help you build strength and stamina safely this spring. And, it will provide you with a fitness base from which you can rocket to new climbing levels over the course of the season. The total length of this program is 8-Weeks. The schedule is adaptable to fit your specific schedule. Climbing session on Monday, strength workout on Tuesday or Wednesday, climbing session again on Thursday or Friday. Go outside and have fun on the weekend. Start with a “reasonable” volume and on a “reasonable” grade. Reasonable volume is about half of what you can do when you’re really fit. A reasonable grade is what you know you can climb confidently. Boulder, or do routes. If bouldering, down-climb for extra volume. Count your hand movements to track your progress and volume. I’ve learned that for me, 100 hand movements is a reasonable place to start after months of not climbing. However, 100 hand movements may be too much for you. Scale the number of hand movements that you do to your own ability. Maybe, you will do only 50 hand movements to begin with. And, rather than increasing by 50 each week, you will increase by 25 each week instead. When I’m on the climbing training program, my goal is 300 hand movements during a single session by the end of the 8thweek. Once I hit 300 hand movements, I find I can warm up to a difficultly that pushes me technically. Yet, I still have the stamina to work on projects. Your goal might be 200 hand movements in a single session by Week 8. Week One– 100 hand movements on easy routes. Week Two– 150 hand movements. Increase route grade for 50 of the movements. Week Three– 200 hand movements. Decrease or drop out easiest routes. Just focus on more volume rather than increasing difficulty. Week Four– 200-250 hand movements. Increase difficulty and volume. *This climbing training program suggests that you do two climbing sessions and one general climbing strength, stamina, and mobility workout each week. Start with a few minutes of light aerobic exercise. Light aerobic exercise gets your body warmed up. Run, bike, row, etc. If you want to add more chest opening exercises to your warm-up, check out More Tips for Bombproof Shoulders and Shoulder Strength. It is very important for climbers to keep their shoulders healthy. Take a few minutes to stretch your calves, quads, hips, and hamstrings. 10 x Hanging Windshield Wiper (5 per side). Keep your legs straight and your hips high. Recovery Week. Take a week off of climbing. You can still do a general strength workout, some light aerobic training, and/or yoga. Make sure you rest. You should feel ready to push difficulty and increase volume after a month of consistent build-up and a week of recovery. Incorporate harder climbing and a cool down on easier terrain each week. Remember to do one of the general climbing strength workouts every week too!